Oh boy. If this is true (big if! ), the PS Vita could be poised for, ahem, a monster comeback. According to Japanese game magazine Game Lab, Nintendo 3DS exclusive Monster Hunter 4 was delayed to summer for a reason other than "improving quality". That reason is apparently that the game is also being developed for the PS Vita. Rumors say (via Game Lab) that the game's getting a simultaneous release on the 3DS and the PS Vita. Why is this a big deal? In Japan, Monster Hunter is the reason why the PSP was so popular. Having it can make a system. Game Lab's rumors certainly aren't always correct. It did correctly say God Eater 2 was going to the PS Vita before that was officially announced. But to be honest, I do not believe that Monster Hunter 4 would get a simultaneous 3DS and PS Vita release. Nintendo, for one, would never allow it. 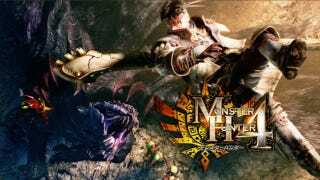 But since Capcom does like multiplatform titles, I would not be surprised if Monster Hunter 4 made it to the Vita in some form or another. Eventually. Now that I believe. Update: When asked if Monster Hunter 4 is headed to the PS Vita, Capcom told Kotaku, "Capcom has made no announcements."